Globe LIVE! 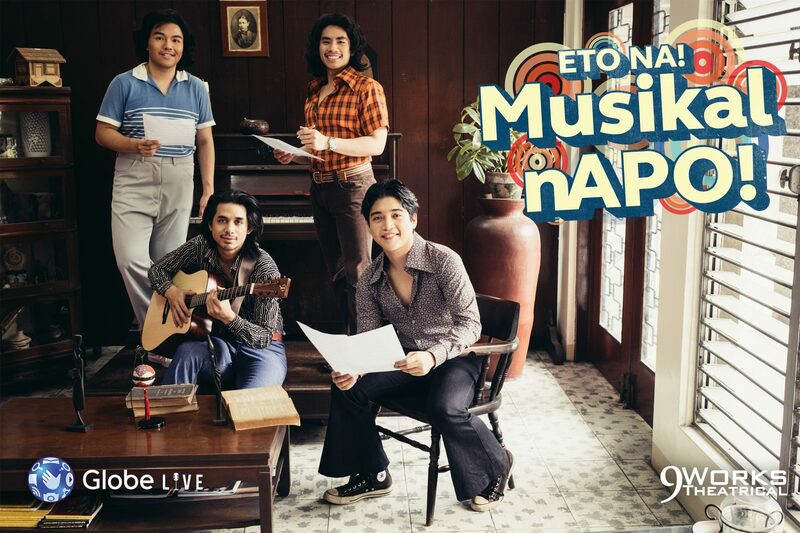 and 9 Works Theatrical are back with Eto na! Musikal nAPO! an original Filipino musical based on the music of the APO Hiking Society, nonetheless. Globe and 9 Works’ first Pinoy musical centers on a barkada’s colorful college life in Manila 1975. It isn’t auto-biographical (let’s straighten that out) but it is inspired by the story of how APO started and came about. APO Hiking Society is an integral part of OPM history. Back in an era when American music was all the rage, APO was among the first to promote OPM inspiring its contemporaries to write in Filipino. With APO’s boyish charms and wonderfully written relatable songs, they captured the hearts of Filipinos from all walks of life. I was in high school when the Kami nAPO Muna was released. Although I grew up watching ‘Sang Linggo nAPO sila, the album gave me a lot of “Kanta pala nila ‘yun?” moments. I’m sure this experience will resonate to younger audiences when they watch the show. This wasn’t the first musical to be pitched to APO but in 2013 when Buboy Garovillo guested in 9 Work Theatrical’s Grease, he gave Director Robbie Guevara the idea to create a musical based on APO’s music. And so Robbie with his dramaturg, and 9WT PR Manager, Jonjon Martin wrote one and here we are 20 revisions later. This is his “baby” and everyday he wakes up thinking about how to improve the script, especially with all the great suggestions from Jim, Buboy, and Danny Javier. Jonjon adds that the musical aims to teach millennials about the good ol’ days. How our parents, despite the lack of technology and 24/7 connectivity, lived. It’s true we take too many things for granted nowadays that we forget to live in the moment. That’s the beauty of APO’s music. They are so relatable that it can hit you right in the heart and make you feel all sorts of things. The first time I heard Batang-Bata Ka Pa was when Dolphy sang it to Serena Dalrymple in the movie Daddy O! Baby O!. I felt so guilty being a stubborn child to my parents. Now, with this musical, it is further proof that APO’s songs are timeless and transcending generations. 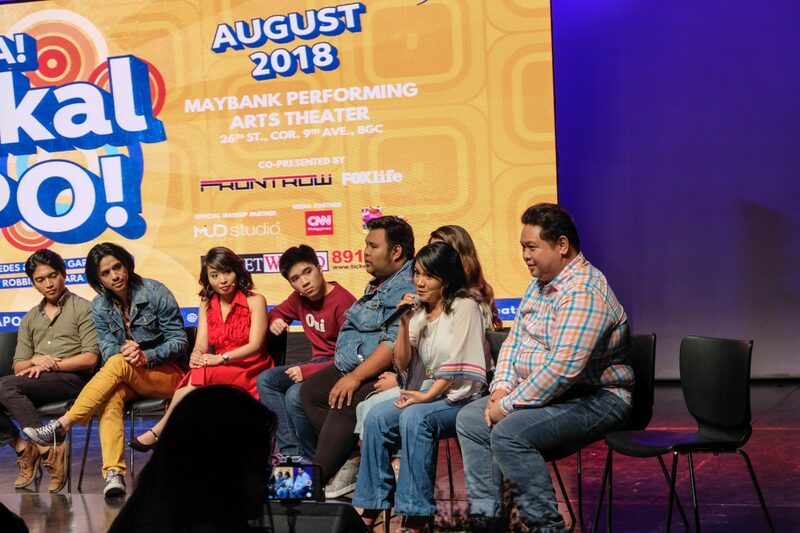 The cast and crew are aware of the other original jukebox Filipino musicals being staged this year like the return Rak of Aegis and new musical El Bimbo. Neomi Gonzales who appeared in Rak and also from PETA emphasized that the trend is a good thing. This is proof that the Filipino theater industry is alive and evolving, she says. Leading the cast is Mark Bautista, who had just returned from Seattle Repertory’s staging of Here Lies Love, together with Jon Philippe Go, Jobim Javier, Alfritz Blanche, Jef Flores, Jon Abella, and Vyen Villanueva. Joining them are Rita Daniela, Marika Sasaki, Sab Jose, Raul Montesa, and Neomi Gonzales. Rounding out the cast are Gian Gloria, Shalee Vicencio, Peachy Atilano-Guevara, Anton Posadas, Jourdan Bartolome, and Derrick Gozos. Eto Na! Musikal nAPO! is a brand new original Filipino musical with music by Danny Javier, Jim Paredes and Boboy Garrovillo, musical arrangements and orchestrations by Daniel Bartolome and Orly dela Cruz. Eto Na! Musikal nAPO! is written and directed by Robbie Guevara, along with Jonjon Martin as dramaturg, Dingdong Rosales as assistant director, Daniel Bartolome as musical director, PJ Rebullida as choreographer, Shakira Villa Symes as lightning designer, Joey Mendoza as set designer, Eric Pineda as costume designer, Dong Calingacion as technical director, Rards Corpus as sound designer, Myrene Santos as hair and makeup designer, Ronan Ferrer as vocal supervisor and Cathy Azanza-Dy as stage coach. Heading the production team are executive producers Santi Santamaria (9 Works Theatrical) and Joe Caliro (Globe LIVE! ), with Globe LIVE! Events Director Denise Seva, the 9 Works Theatrical Team – Anna Santamaria as company manager, Jonjon Martin as PR manager, GM Hernandez as marketing manager, Arma Bonilla as stage manager, Gian Nicdao as graphic design manager and JC Inocian as photographer. Eto Na! Musikal nAPO! will be shown at Maybank Performing Arts Theater, Bonifacio Global City, on August 3-5, 10-12, 17-19 & 24-26, 2018, at 8:00pm on Fridays, Saturdays & Sundays, and 3:00pm on Saturdays & Sundays. Tickets available at Ticketworld. Eto Na! Musikal nAPO! is a production of 9 Works Theatrical and Globe LIVE!, co-presented by FOXlife and FRONTROW, with MUD (Make Up Designory) as the official make up partner, and CNN Philippines as media partner. Special thanks to BGC Arts Center.